What would you pin point the series loss too? "We had a hard time with the line. No matter what we tried we had a hard time matching up against that line (Bartschi - Rattie - Noebels). Some of the decisions that we made while we were out there against them were not the smartest decisions when you are playing up against a line like that. That line did about 90 percent of their goal scoring in this series and we didn't have an answer for them in regards to shutting them down. We do a pretty good job against them and then we make one little mental mistake and they kill you." What will this do for your young defensive core. What won't kill them will make them stronger? "I think that is the strength of our team. Our back end right now. When you look at our group, it was 16 and 17 year-old's on the back end and Myles Bell and MacKenzie Johnston are 18. I think they are the most intelligent players on our team. They make good decisions as to when to jump into the play. I think they are smart enough to allows us to be more active with our back end next year and I really think those will be the guys that are going to generate, or help generate, a lot of offense for us. They have good instincts and good hockey sense and once they grow a little bit more and mature, and use some of the lessons they learned in this series, I think they are going to be very good - as a group - in the future." Talk about the loss of Mitchell Chapman. Your oldest player didn't play a game in the series? "Everyone talks about 19 or 20 year old players. You need your older guys at this time of the year. They are the guys that are able, or are physically able to handle the heavier minutes. Mitchell (Chapman) is also one of those guys, I am willing to bet, would have gotten a few good hits on one of those two guys over the course of the series, so it is difficult to lose your older most experienced defenceman." What did you say to the players after the loss? "We go in there after every game. It is tough after the game because you have that pit in your stomach. You see the guys. The eyes of some of the older players, they know what happens at this time of the year that everybody goes their separate way. I told them that I thought they competed at the end. I thought it was good that they didn't roll over these last couple of games here at home against a very good team." What was it like to coach this group, the youngest team ever in Rockets history? "This was the hardest year for me for sure, by far. Maybe I underestimated even the youth...the amount of youth in regards to our practices. I think their were times over the course of the year that they froze a few times and didn't play the way I feel they were capable of. That is a learning experience for me and a challenge finding the fine line between really pushing hard and getting a player to lose his confidence. I think in the five years I have been a head coach here their has been something different every year that we have had to deal with. 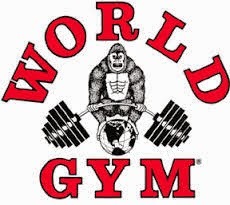 You become a better coach for it." Brett Bulmer played his final game in a Rockets uniform and he ended his career on a high note? "He skated hard. I thought he was physical. He was able to keep his focus with him. That is the thing with Brett. When he wants to play the game he is a dangerous and special player. When he sometimes lets his emotions or his frustrations get the best of him, that's when he struggles and that's what we saw in game two when he ended up taking that suspension. He is a special player when he going and playing the way he is capable of. He skated very well, he has great size and he can do a lot of good things on the ice". Outside of the obvious player graduations, do you expect this team to look differently next season? "That's really Bruce (Hamilton) and Lorne's (Frey) call. As coaches it is our responsibility to make them into players and get this team to perform well. Bruce and Lorne always get us the people that we need to work with. I think as always their is going to be some movement. We are disappointed in the season we had in regards to where we finished the regular season. I think we could have had five to seven more wins over the course of the regular season and we would have maybe not faced Portland in the first round. I think you look at things in every area and if their are things that we want to make changes in, then somethings will be addressed over the summer. I know one concern that Bruce (Hamilton) has is the size of our team. The size of our group is still small. I think at this time of the year it is hard for the smaller guys to play through. You look at the bigger teams, they are typically the ones that move on and have a lot of success. I'm not saying that a smaller guy can't do it, but those smaller players have to very tenacious". 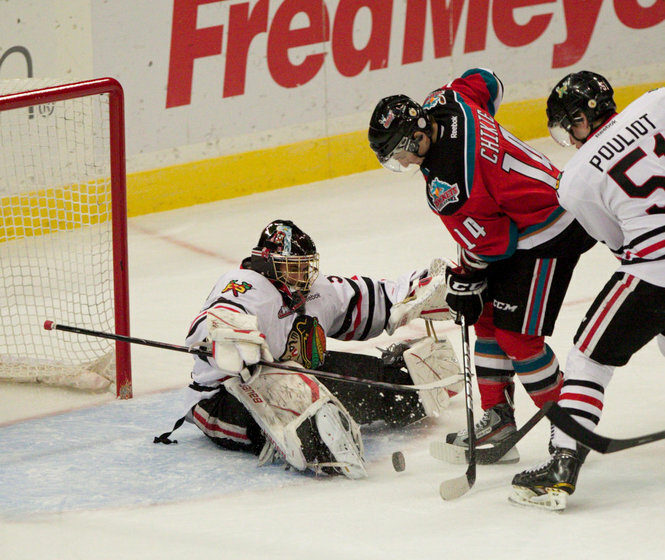 The Kelowna Rockets season ends with a 5-3 loss to the Portland Winterhawks. Hawks win the series in four games. "Obviously a lot of thought went into it. There were a couple of things that were integral into the decision. We were fortunate their was no injury to the opponent. He (Wrenn) was able to play for Portland in last night's game, so that was great to see from that perspective. Secondly, going on Brett Bulmer's record in our league. He (Bulmer) has not been suspended by us before so he certainly is not in the repeat offender category which would have certainly increased the suspension. We are certainly concerned with how the game went and clearly he took a number of penalities and several for kneeing. I've had a real good conversation with the owner and general manager of the Kelowna Rockets and made sure he is clear that we (WHL) won't tolerate a similar situation tomorrow night when he returns as we did the other night." Question: Did you just look at the one kneeing major in your decision making, or the events that led to that? "You do take into context that he did have kneeing penalties in the game and that is a real concern because I find it to be a very dangerous play. Certainly the one in question, the major and game misconduct, was the correct call. If the opponent had been injured and not been able to play last night, the suspension would have been longer." Brett Bulmer will be back in the Kelowna Rockets line up tomorrow night in game four of their opening round series with the Portland Winterhawks. The Western Hockey League made it official today. Bulmer served that one game suspension last night in the Rockets 6-3 loss. Bulmer was suspended after receiving a 5 minute major for kneeing in Saturday's 4-0 loss in Portland. The 19 year-old led the Rockets in goals (34) and was named the team MVP. It was the Kelowna Rockets best effort of the series. Unfortunately it still wasn't good enough to beat the Portland Winterhawks. Ty Rattie and Sven Bartschi each had two goals and two assists as the Hawks moved within one game of eliminating the Rockets in the opening round of the playoffs. Game four is Thursday night at Prospera Place. The Hawks top line of Rattie, Bartschi and Marcel Noebels combined for 11 points in the win. Rattie now has six goals in the series, as many goals as the Rockets have in the first three games. While the Hawks leading scorer is having a heck of a series, Kelowna's leading point producers, Shane McColgan, has just two assists. While the final score reads 6-3, this was essentially a one goal game. The Rockets pulled goaltender Adam Brown late in the game when the score was 4-3. The Hawks would score two empty net goals to make it a three goal differential. Speaking of Brown, he was extremely sharp in the first period when the Hawks really poured on the pressure. Brown was able to get the home team out of the period down by just a goal. It was another 20 shot period, something that has been common place in the first three games. The Hawks don't start slowly. That is a good sign of a championship team. Brett Bulmer sat out game three after being suspended by the WHL after receiving a five minute major for kneeing in game two. With the Rockets determined effort last night, the addition of Bulmer may have been enough to help the Rockets earn their first win of the series. The player Bulmer hit, William Wrenn, did play Tuesday night and didn't appear to be laboring in anyway. The Hawks played the game without 20 year-old Oliver Gabriel, but a familiar face entered the scene. Gabriel sat out game three with a suspension but 17 year-old Brendan Leipsic returned after missing the first two games with an undisclosed injury. Leipsic was very good and his breakaway pass to Brad Ross in the second period was just one example how good this 1994 born player is. I was really impressed with the play of 21 year-old Brett Lyon. This was Lyon's best effort in a Rockets uniform. The Grand Forks BC resident was solid on the fore check and played a determined game. Lyon was rewarded by coach Huska, who played him down the stretch when the Hawks were clinging to a 4-3 lead. Hawks goaltender Mac Carruth struggled last night, especially with long shots. The 19 year-old had trouble tracking the puck. Carruth was beaten on all three goals from long range. Give the Rockets forwards credit though for creating traffic in front of him. Carruth was even beaten by defenceman MacKenzie Johnston on a long range blast, but the goal was called off on an off side. I thought this was the most composed the Rockets defensive core has looked in the series. Sure, the puck was still turned over and their youth couldn't be hidden, but it was a much better effort by the group. The worst the d-core looked was obviously on the Hawks 3rd goal, when as a unit, they couldn't clear the zone no matter how hard they tried. Colton Sissons ended up getting his pocket picked by Noebels, who passed it to Bartschi, who faked a shot and sent it to Rattie for his second of the game. Overall, this was a fun game to call. The flow was extremely good in the second period as the Rockets elected to exchange scoring chances. The d-core was pro-active in joining the attack, which set them up for disaster if the puck was turned over, but in retrospect, it was the right move as it caused the Hawks more headaches in the defensive zone. Game four is Thursday. It should be fun. The Rockets have not been swept in a series since 1994, when as the Tacoma Rockets, the team was swept in 4 games by the Hawks. Rockets fall 6-3 to the Hawks and now trail the series 3 games to none. Tonight’s Preview: The Kelowna Rockets face the Portland Winterhawks in game three of a best of seven Western Conference Quarter Final Series. The Hawks have a 2-0 lead after a 6-3 win in game one and a 4-0 victory in game two. Game three and four in the series are tonight and Thursday in Kelowna with game five Saturday in Portland. These two teams are meeting for the second straight post season after a six game series (Hawks 4 Rockets 2) in round two a year ago. These two teams were separated by 30 points in the regular season standings with the Rockets going 0-3-0-1 against Portland. The Hawks out-scored the Rockets 15-9 in the four regular season games, but two of the four were decided by a single goal. Game Two Recap: Mac Carruth made 20 saves in a 4-0 shutout over the Kelowna Rockets. Sven Bartschi collected three assists and now has five helpers in two games. Brad Ross, Troy Rutkowski, Ty Rattie and Tyler Wotherspoon scored for the Hawks. Adam Brown made 35 saves in the loss. The Rockets were 0 for 5 on the power play and surrendered a shorthanded goal. Game One Recap: Zach Franko scored once and added an assist as the Rockets fell 6-3 to the Portland Winterhawks. Cody Chikie and Colton Sissons also scored while Brett Bulmer added two assists. The Rockets held a 1-0 lead after 20 minutes and trailed 3-2 after two periods before the Hawks scored three-third period goals in the win. The Rockets and Hawks were both 1 for 4 on the power play. Portland out-shot Kelowna 55-29. Playoff Performers: The Rockets have 252 games of WHL playoff experience. Spencer Main leads the Rockets in playoff experience with 34 games. Shane McColgan leads the way in points with 9+15=24 in 28 career playoff games. McColgan had 20 points (8+11=19) in ten playoff games last season. Brett Bulmer (24) Jesse Astles (23) and Brett Lyon (22) round out the top five in terms of playoff experience. Who’s Hot: Shane McColgan had his eleven game playoff point streak snapped Saturday night. McColgan had a point in every playoff game last season…Brett Bulmer has twelve goals in his last fifteen games…Zach Franko has 2+4=6 in his last five games (regular season included)…Myles Bell has six points (2+4=6) in his last eight games (regular season included). This and That: The Rockets are 5 and 4 in their last nine game 3’s dating back to the 2008 playoffs…The Rockets lost the first two road games of a playoff series against Everett (2010) before winning the next two games on home ice. In that series, the home team won six of the seven games…The Rockets were shut out Saturday night in game two. Prior to that, the Rockets suffered a 4-0 loss in game five against Everett on March 26/2010….The Rockets gave up six goals in game one. The Rockets also gave up 6 goals in a game two loss to the Hawks in last year’s second round playoff series. Ryan Johansen had three goals in the win on that night…..MacKenzie Johnston’s assist in game one was his first career playoff point in 11 career games…. These two teams have met twice in the second round of the playoffs. In 1994, the Hawks eliminated the Tacoma Rockets in four straight games. Last season the Hawks eliminated the Kelowna Rockets in six games…Seven members of the Rockets made their WHL playoff debuts against Portland Friday night including veteran d-man Myles Bell. Bell has played 189 career games but had never experienced a playoff games after three seasons with the playoff-less Regina Pats….Brett Bulmer has 7+8=15 in 25 career playoff games. Bulmer had three goals in last season’s second round series against the Hawks…The Rockets were 4 and 1 in five playoff road games last season. The only loss was in game two of a second round playoff series in Portland….Rockets head coach Ryan Huska is coaching in his 66th career playoff game…Zach Franko became the first player since Justin Keller (2004-2005,2005-2006) to play in all 72 regular season games. Franko has played in 144 consecutive regular season games…The Rockets won over 30 games (31) this season. Since moving to Kelowna for the start of the 1995-96 campaign, the Rockets have registered 30+ wins 14 times over 17 seasons….When Brett Bulmer scores the Rockets are 14-3-2-3. In other words, the team has lost only three times in regulation when Bulmer lights the lamp…Since the Christmas break the Rockets are 10-7-2-2 in 21 road games….This season the Rockets were involved in a league high fifteen games that required a shootout. The Rockets were 9 and 6 in those fifteen shootout situations…Tyrell Goulbourne led the team with 17 fighting majors. Mitchell Chapman had eleven….The Rockets were involved in 37-one goal games this season. The Rockets were 18-9-4-6 in those thirty-seven games. Let me go on record as stating I don't think Brett Bulmer is a dirty player. He really isn't. I think Portland Winterhawk fans may be questioning that after what they witnessed Saturday night, but Bulmer is an emotional player that obviously went over the line. Is Kamloops Blazers forward Brendan Ranford considered a dirty player? Nope. Yet he lost his cool last season and made contact with a linesman as he was being escorted to the penalty box. Ranford was promptly suspended. So while I suggested the kneeing incident on William Wrenn would be considered a 'dirty play', I don't consider Bulmer a dirty player. Clearly frustrated, he went over the line much like Ranford did. It happens, even to the most skilled players on a team. Whether Bulmer plays in game three or not isn't the Rockets real problem. The problem lies with other players stepping up their game in an effort to make this a series. Shane McColgan was one of the main reasons the series last year against the Hawks went six games. McColgan was tremendous, especially in game one. So far, McColgan has just one assist. We have to remember that the Rockets were playing without their top defensive defenceman in the first two games of this series. Mitchell Chapman, who was named the teams top d-man at the year end awards banquet, is out with an upper body injury. The 19 year-old would be blocking shots and would definitely make life a lot tougher along the boards for the Hawks forwards if he was in the line up. I can't recall one real good hit that a Rockets d-man has made on a Hawks forward in the first two games. Without Chapman the Rockets are icing just one 19 year-old player. That one 19 year-old player is Brett Bulmer. The Hawks have nine-19 year-old's on their roster. Would I consider Hawks forward Brad Ross a dirty player? He has a spotty track record, but in saying that, how composed has he been in this series. Ross was like a choir boy in the first two games. It looks like Head Coach Mike Johnston has him reeled in pretty good. Ross is clearly a better player when he keeps his composure, plays with an edge, but doesn't take bad penalties. Mission accomplished in the first two games. We had a lot of discussion on this blog Sunday about how Adam Brown's mom was treated in Portland. I am sad to hear her experience wasn't a good one. I would hope any parent of a visiting player would be treated with respect while watching his or her son play. I know that if a Hawks fan was being abused at a Kelowna game, and I saw it happening, I would step in to defending that person. Friendly banter is part of it. Being rude, offensive and making the entire experience miserable for a visiting fan is unacceptable. The officiating. I haven't said much about it in the first two games because it really hasn't been a factor. I've just accepted it for what it is. It is never really that good and that won't change. I prefer the two teams being allowed to play rather than the referee's being whistle happy. For the most part the first two games haven't been over-officiated. I am patriotic, but sometimes I wonder if we are wasting our time with the national anthems at the start of the game. It is tough for organizations to find real good singers to belt out the anthems and at times it can be ugly. But when it is done right look out. How about the national anthem duet before Saturday's game in Portland. Outstanding. No cheerleaders in Portland. Very disappointed. Haha. The Rockets lost all three games at home to the Hawks in last years playoff series. The scores were 5-4, 4-2 and 4-2. Overall, the Rockets are 5 and 5 in their last ten home playoff games dating back to the start of the 2010 playoffs. The teams last home ice playoff win was in game two of an opening round series with Prince George in last years playoffs. The Rockets beat the Cougars 7-4 on March 26th. A Rockets fan was complaining the other day about Sven Bartschi being in the WHL. "He's too good. He should be in the NHL, not playing major junior hockey". He may have a point, but let's celebrate the fact we can see these type of players at 'our' level rather than witnessing NHL teams rushing underage players into pro hockey. We've seen too many 19 or younger players pushed into the NHL where they crash and burn. I wish a steadfast rule was in place that stated if you are 19 or younger, that player is prohibited from playing pro until his junior season is over. His teammates call him 'Bull'. Unfortunately Saturday night in game two of the Kelowna Rockets opening round series with the Portland Winterhawks, leading goal scorer Brett Bulmer was a raging bull. The 19 year-old was assessed a five minute major for kneeing in the third period in the Rockets 4-0 shutout loss. Bulmer, who is of more value to his team on the ice than off it, was given two unsportsmanlike penalties, two kneeing penalties plus a 5 minute major for kneeing and a game misconduct. I am all for playing with emotion, but keeping it dialed in is pivotal at this time of the year. If a player receives one kneeing penalty, I usually give him the benefit of the doubt. Sometimes knee on knee collisions happen. When you are assessed three in game, you can't but look at it as dirty play. I know if Hawks forward Brad Ross was doing it, I'd be saying it. In fact, I did say it last season when Ross hit Franko in the opening game of the second round. It was a dirty hit and knocked out Franko for the remainder of the series. Fact is, emotions run high and sometimes logical thinking is thrown out the window. While I don't condone Bulmer's actions, it sure would have been nice to see more of his teammates play with more bite. The Rockets were an easy team to play against Saturday night and the Hawks dominated play. Portland didn't only carry the territorial play, but they had possession of the puck about 80 percent of the time. Chasing the puck was common place for the visitors and creating any real quality scoring chances didn't happen until late in the third period, when down 4-0, Zach Franko and Shane McColgan had good chances on goal. Hawks goaltender Mac Carruth had an easy night in recording the shutout. As badly as the Rockets were out-played in game two, Adam Brown gave his team a chance. We were scoreless after 20 minutes despite the Hawks directing 20 shots on net. Brown looked even more composed than he was in game one and didn't overplay pucks. Goaltending is not the issue in this series, nor will it be. Rockets captain Colton Sissons hardly played Saturday night after being struck with the flu. I knew something was wrong when he saw little ice time and his battle level was at an all time low. When Sissons is healthy, he is always one of the Rockets hardest workers. Best player in the series so far? Easy. It is Sven Bartschi. Wow. If you haven't seen this 19 year-old play this season, check him out when the Hawks are in Kelowna Tuesday and Thursday. Bartschi could be the best player in the WHL. Tri City Americans fans may argue, but the Swiss forward can skate, looks strong on the puck and plays with a little bit of bite. Bartschi gets mad when he is hit and will let the opponent know that he is irritated about it. As Andy Kemper pointed out on his blog, http:afterthewhistle.wordpress.com, Bartschi has been in on five of the Hawks ten goals in the series. The Rockets have been out-scored 10-3 in the first two games. Shane McColgan had his 11 game point streak in the playoffs snapped Saturday night. McColgan's point streak dated back to last season. While the Rockets lost both games in Portland on the weekend, not all is doom and gloom with the next two games at Prospera Place. 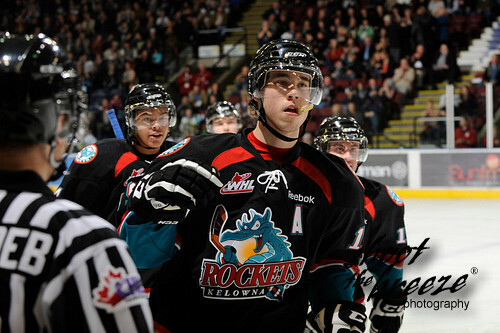 Back in 2010, the Rockets lost games one and two in Everett before winning both games in Kelowna. In fact, in that series the home team won six of the seven games. After a 7 hour trip back to Kelowna, it is time for some sleep. I will post some thoughts later this afternoon. The Portland Winterhawks are one of the best teams at capitalizing on the other teams mistakes. 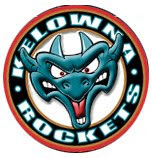 In game one of an opening round playoff series at Memorial Coliseum, the Kelowna Rockets made far too many that resulted in the puck ending up in the back of their net. The Hawks struck for three goals in the second and three more in the third in a 6-3 win. The Hawks have a 1-0 lead in the best of seven series with game two tonight on AM 1150 at 6:30. Despite the lopsided score, this was a tied game for 39 minutes and 59 seconds. A soft clearing attempt resulted in Hawks d-man Joe Morrow keeping the puck inside the zone, putting on a stick handling clinic, before snapping a shot past Adam Brown as time was ticking down. Bad clearing attempt - good play by Morrow - a shot that Brown would normally stop. Add it all up and the Hawks carried a one goal lead into the third period. For the Rockets to have a fighting chance in this series they need to capitalize on their chances. I can recall five golden opportunities to score, yet the Rockets came away with nothing. Myles Bell, Cody Chikie, Shane McColgan on a two-on-one with Damon Severson, Carter Rigby with an open net after Hawks goaltender Mac Carruth miss played the puck are just four examples. The fifth scoring chance had Rockets forward Colton Heffley picking up a rebound at the side of the Hawks net but failing to put it home. Even if you cut those scoring chances in half, and capitalize on them, that gave the Rockets a chance to win the game. Ty Rattie will get the glory with his three goals, but I sure liked Oliver Gabriel. A big power forward, Gabriel was tough to handle and did so many good things in the offensive zone. If a big player can possess skill , like Gabriel does, he catches my eye every time. Maybe it was just me, but I thought the 20 year-old caused a lot of trouble for the Rockets defensive core. Don't get me wrong, Sven Bartschi was good but the Rockets were guilty of not laying enough body on him for my liking. Rattie's second goal was a good example. Bartschi literally dangles/squeezes away from three defenders before getting a shot on goal that Brown stops. Rattie scores on the rebound. The Calgary Flames first round pick is quick, but for three players within two feet of him to not lay a finger on him is a killer. When the Rockets did make contact with Bartschi, he became frustrated. That needs to happen with more regularity in game two. Brett Bulmer did give up the puck on the Hawks third goal, but I still thought he played a strong game. Bulmer played physical, played with an edge and was an agitator. The line of McColgan, Bell and Sissons looked out of sync. That needs to change in game two. One line can't carry the mail. 55. That shot total for the Hawks may look bad on the stats page, but it didn't feel that way. The Hawks fire everything at the net so Brown was busy. But this wasn't an all out assault in the Rockets zone. In fact, the Hawks didn't register a shot on goal in the first 7 minutes of the second period. The game ended with a bang, when at the buzzer, Rockets goaltender Adam Brown picked up the puck in the corner and promptly put it in his glove and skated off the ice. The linesman wanted it, as did the Hawks, but Brown wouldn't give it up. It is still unclear if Brown ever gave it back. Way to many turnovers, especially within 5 feet of the blue line. Not physical enough for my liking. You don't need to crush people, but make contact. Missed chances in the offensive zone. No less than 5 golden chances. Brown wasn't bad, but could be better. Discipline. The Hawks had only four power play chances. Creating scoring chances; enough to win a game in my opinion. Ability to bounce back after being down by a goal. They did it twice. If the Rockets played a picture perfect game, I'd be concerned. Lots of areas for improvement. Great crowd at Memorial Coliseum. Solid atmosphere and a great night of hockey. 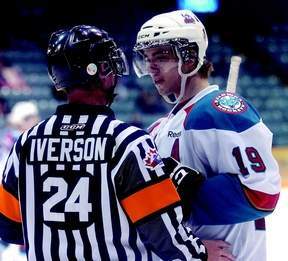 Tonight’s Preview: Welcome to the 2012 Western Hockey League playoffs. The Kelowna Rockets, the 6th seed in the Western Conference, meet the 3rd seeded Portland Winterhawks. These two teams are meeting for the second straight post season after a six game series (Hawks 4 Rockets 2) in round two a year ago. These two teams were separated by 30 points in the regular season standings with the Rockets going 0-3-0-1 against Portland. The Hawks out-scored the Rockets 15-9 in the four games but two of four were decided by a single goal. Game one and two in the series are tonight and tomorrow in Portland before the series shifts back to Kelowna for games three a four next Tuesday and Thursday night. The Rockets closed out the regular season last Saturday with a 4-3 shootout win over visiting Vancouver. The victory helped the Rockets to a 31-31-4-6 regular season. *The Rockets out-shot the Hawks in two of the four games in the seasonal series. The Hawks out-shot the Rockets 149-123 overall. The Rockets were 2 for 20 on the power play in the four games (10%) while the Hawks were 4 for 16 (25%) with the power play. Playoff Performers: The Rockets have 216 games of WHL playoff experience. Spencer Main leads the Rockets in playoff experience with 34 games. Shane McColgan leads the way in points with 9+14=23 in 26 career playoff games. McColgan had 19 points (8+11=19) in ten playoff games last season. Brett Bulmer (22) Jesse Astles (21) and Brett Lyon (20) round out the top five in terms of playoff experience. Who’s Hot: Shane McColgan is riding a ten game point streak in the playoffs. McColgan had a point in every playoff game last season…The Rockets have a power play goal in eleven of their last fourteen road regular season games (17 for 51 or 33%)...Brett Bulmer has twelve goals in his last thirteen games…Zach Franko has 1+3=4 in his last three games…Myles Bell has six points (2+4=6) in his last six games. This and That: These two teams have met twice in the second round of the playoffs. In 1994, the Hawks eliminated the Tacoma Rockets in four straight games. Last season the Hawks eliminated the Kelowna Rockets in six games…Seven members of the Rockets are making their WHL playoff debuts against Portland including veteran d-man Myles Bell. Bell has played 189 career games but has never experienced a playoff games after three seasons with the playoff-less Regina Pats….Brett Bulmer has 7+4=11 in 22 career playoff games. Bulmer had three goals in last season’s second round series against the Hawks…The Rockets were 4 and 1 in five playoff road games last season. 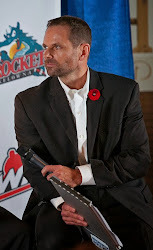 The only loss was in game two of a second round playoff series in Portland….Rockets head coach Ryan Huska is coaching in his 64th career playoff game…Zach Franko became the first player since Justin Keller (2004-2005,2005-2006) to play in all 72 regular season games. Franko has played in 144 consecutive regular season games…The Rockets won over 30 games (31) this season. Since moving to Kelowna for the start of the 1995-96 campaign, the Rockets have registered 30+ wins 14 times over 17 seasons….When Brett Bulmer scores the Rockets are 14-3-2-3. In other words, the team has lost only three times in regulation when Bulmer lights the lamp…Since the Christmas break the Rockets are 10-5-2-2 in 19 road games….This season the Rockets were involved in a league high fifteen games that required a shootout. The Rockets were 9 and 6 in those fifteen shootout situations…Tyrell Goulbourne led the team with 17 fighting majors. Mitchell Chapman had eleven….The Rockets were involved in 37-one goal games this season. The Rockets were 18-9-4-6 in those thirty-seven games. Rookie forward Tyson Baillie is seen here picking up the pucks after this mornings practice at Memorial Coliseum in Portland. Rockets rookie Tanner Moar leaving the ice surface at Memorial Coliseum after this mornings workout. Moar is one of seven Rockets making their playoff debuts tomorrow night. Adam Brown will be pivotal to the teams success in this series. Seen here with me grilling him after Thursday's practice. It is off to Portland today in advance of Friday's game one opener between the Rockets and Hawks. With the closure of the Coquihalla Highway until 4 o'clock this afternoon, travel plans have changed as we seek lower ground. That means a trip through the Osoyoos border crossing. It also means an additional hour of travel, so the trip will turn into a 9 and a half hour affair. Bring a pillow! Rockets Assistant Director of Public Relations Kevin Parnell will be joining me on the trip. Yes, we are not traveling with the team but are again driving the AM 1150 Community Cruiser. You can't miss us with - News - Talk - Sports lettering on the front and sides of the Honda Pilot. Parnell will provide color commentary on the radio broadcasts as Gord McGarva stays home because of more important matters. It's called family. AM 1150 will again provide it's listeners with an extended post game show in the playoffs. Parnell will be armed with a remote microphone and will go down to the dressing room for post game comments with Rockets players. This worked to perfection last season at the Rose Garden and adds to the overall sound of the broadcast. Like the players, even the radio guys need to elevate their performance in post season. Let me stick my neck out and admit that I predicted the Rockets to beat the Hawks last night on Dan Russell's 'Sports Talk'. My theory is you don't bail on the team you call the games for even if rough waters are ahead. And trust me, this series is no canoe ride. There are white rapids ahead and the Rockets will have to be skilled in order to get through them. There will be bumps along the way. But in sport, like in life, anything is possible. Blazers broadcaster Jon Keen picked the Hawks in six while Royals play-by-play man Marlon Martens also took the same approach. Vancouver Giants radio man Dan Elliott was the only one to predict the Hawks advancing in four short games. A buddy of mine laughed at my prediction. I'm fine with that. But my philosophy in sports has always been the same. When I golf with him, my objective is to beat him. He is a scratch golfer and I am a 22 handicap. He plays 70 rounds of golf a year and I play 10. Despite those odds, I don't lie down and play dead. If you are a competitive person you never go into anything defeated before the game has even started. 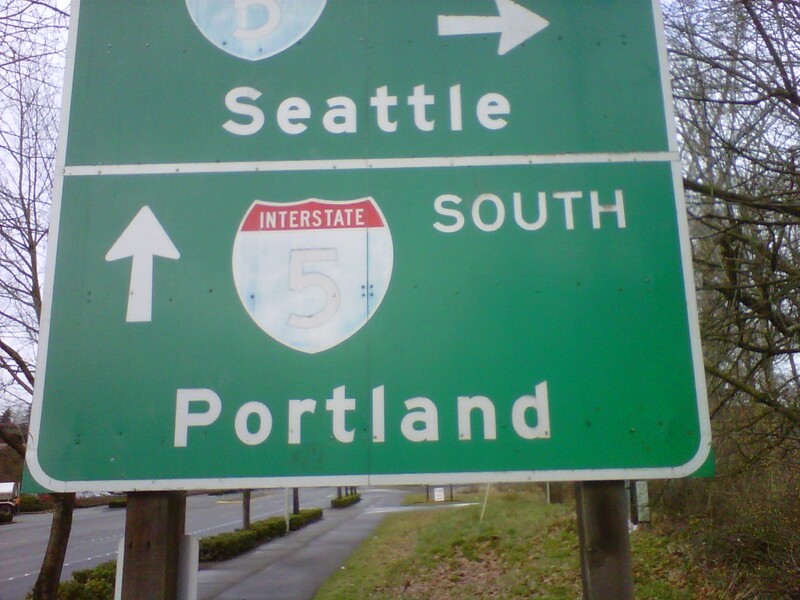 Both games in Portland are at Memorial Coliseum. It opened in 1960, eight years before I was born. It looks old. It is as old and tired as I look! It is no Rose Garden. But in saying that, once the game starts the focal point is on the ice, not on the luxurious amenities that surround you. While the neutral zone is smaller, the Coliseum has an old school feel to it. And heck, if the cheerleaders come out and rock it, I'm all good. The plan at Memorial is to stand up while doing the broadcast. Over the years I have always sat down in that location considering I may block the view of the off-ice officials and fans seated nearby . I have now been told that standing, which I always do while calling a game, is acceptable. The only concern I have is Winterhawks Booster Club Head Poobah Stuart Kemp throwing popcorn on my head. I hope to interview several Hawks players and feature them on our broadcasts during the series. I think this gives Rockets fans specifically a better understanding of these players and the individuals they truly are. I too get a better appreciation for them when you stand face-to-face and see them as a person, a teenager, a son and not some face-less player with a name bar across his shoulders. I would like to hear from Brad Ross or Mac Carruth and find out what makes these players tick. I find it interesting that the Hawks are meeting the Rockets in the first round? I say that after Hawks GM Mike Johnston didn't hide the fact that he was interested in acquiring Brett Bulmer at the trade deadline. I applaud Johnston for openly speaking to me about it when we chatted in early January. Could you imagine if Bulmer was indeed a Hawk and playing against his old team in the playoffs? Weird. Maybe the Hawks would have given up a first round pick, much like they did to Seattle for Marcel Noebels, to get Bulmer? All I know is Rockets GM Bruce Hamilton wanted a player, a prospect, a proven performer if he was going to move Bulmer. Johnston says he wasn't willing to do that. There is a pretty good 1994 born player on the Hawks roster that I am sure many teams inquired about but Johnston wisely held onto him. See you down in Oregon State. 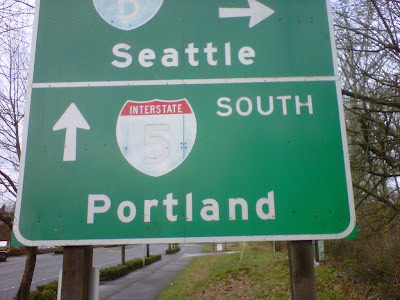 If I am no where to be found Friday night in the broadcast location, I likely took a right instead of a left somewhere in Washington State. That, or I am in jail after going one mile an hour over the speed limit in Moses Lake or Yakima. Hey, someone in Portland tell Andy Kemper to kick his blog back into gear. I'm looking for a good read. That 'Happy New Year' post is getting old. Rockets: Brett Bulmer and Shane McColgan. Bulmer led the team in goals (34) and was as dominant a player the WHL has seen this season when he put his mind to it. Bulmer played some of his best hockey against the elite teams, so it leads me to believe he will make a big contribution against the Hawks. The 19 year-old had six goals against Kamloops and two each against Tri City, Portland and Edmonton. McColgan had five goals and nine points in last years second round series with Portland. Hawks: Ty Rattie. When you finish third in league scoring and you are still just 18, Rattie stands out like a player with his hair on fire. You can`t help but notice him. Rattie had 42 more points than a season ago. Does he reach 140 points as a 19 year-old next season? Rattie had 4+5=9 in four games against the Rockets in the seasonal series. Rattie had 3+3 in six games in last years second round playoff series. Joe Morrow. The 19 year-old scored 17 goals and collected 64 points on the Hawks blue line this season. Morrow is confident with the puck and has a tremendous shot from the point. Morrow was second in scoring when it came to WHL defenceman. Morrow was a 1st round pick of the Pittsburgh Penguins. Kelowna: Colton Sissons is the top rated forward from the WHL heading into the NHL draft. Sissons could have a heavy influence in this series. With 26 goals and an impressive work ethic to match, the draft eligible 18 year-old captain is worth keeping your eyes on. Hawks: Derek Pouliot. You know how much I like Saskatchewan born players and the Weyburn produce falls into that category. A sure fire first rounder, Pouliot does a lot of solid things in the offensive zone but doesn't get the credit for his defensive exploits. It will be interesting to watch closely how much better Pouliot is than Rockets rearguard Damon Severson. Pouliot was a first round bantam pick (1st overall) while Severson was a 9th rounder in 2009. Without question the scouts will be watching. Rockets: Adam Brown. A series upset over Portland doesn't start and end with Adam Brown but pretty close. Brown has to be one of the best players on the ice to give his team a chance. The 20 year-old will have to be like a bank robber in this series and get away with thievery in an attempt to frustrate the Hawks top scorers. In last season's second round, Brown made 45 saves in a game one win and then turned aside 54 in a game five victory. Hawks: Mac Carruth. I don't think he gets the respect he deserves because he plays on a team with so much talent. The 19 year-old put up 42 wins, the most of any goaltender this season. It wasn't like Carruth was sitting idly by though. He made the 6th most saves of any WHL goaltender. In last years playoffs he averaged 36 saves a game, so it wasn't like he was back there having a snooze. Carruth has 32 games of playoff experience under his belt. Brown has just 13. Kelowna: Shane McColgan. I had to throw this category in there because opposition fans will always find one or two players from each team that just grind their gears. Shane McColgan plays an agitating style that usually gets under the skin of the opposition and then backs it up with a timely goal. McColgan is like that pesky little brother than drives you crazy. He likes to yap. Hawks fans won't like him by series end but will know he is out on the ice by the way he plays. Hawks: Who else. Brad Ross. Remember the hit he had on Zach Franko in last years playoffs? Ross too plays on the edge and loves to get into the grill of any player willing to give him attention. Ross can talk the talk and walk the walk. If you can rack up 163 penalty minutes and still score 42 goals, I want you on my team. Mac Carruth could also fall into this category and could be enemy #1 before the series is through. Regardless of what you think of these three players, remember that they play with a heart beat and love to stir it up. I would take that over a player who has little desire to compete and make a difference. 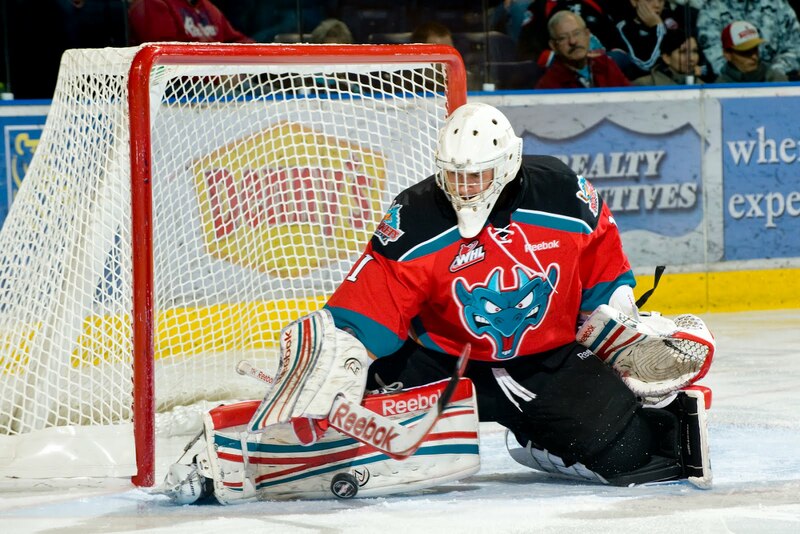 Kelowna: Brett Bulmer. When you start the season by playing nine games with the NHL's Minnesota Wild, you can't but be impressed by what Bulmer accomplished in early October. Did his return to junior hockey help his development? No question. Bulmer wouldn't have played in crucial situations at the NHL level and would have been with a team that regressed as the season wore on. Instead he was the go-to-guy and was named the Rockets MVP. Hawks: Sven Bartschi: Ok, Bartschi scores three goals in four NHL games as an emergency call up. That my friends is impressive. I think the Calgary Flames got it right when they selected Bartschi in the first round. When you are 10th in league scoring and you played just 47 regular season games you are a stud. Bartschi has averaged 1.6 points per game over his short two year career. Only six times this season was he held off the score-sheet. Wow! Rockets: Carter Rigby. A 21 goal man in his rookie season, the just turned 18 year-old can provide some much needed scoring if Brett Bulmer is checked into the ice. Rigby can shoot the puck and could be 'that player' who makes a difference when everyone is counting on Sissons, Bulmer and McColgan to provide the bulk of the scoring. Hawks: Brendan Leipsic. I really like this player. Crafty, Leipsic does so many things well and his 28 goals are a testament to how gifted this player really is. This 17 year-old will score 50 goals in this league without question. Leispic had 12 multiple point games this season. Small but mighty. It looks like Hawks goaltender Mac Carruth (photo by Marissa Baecker) isn't impressed that his team is facing the Rockets in round one. All joking aside, the best of seven series begins Friday in Portland. I am all about sharing my opinion on this series, which I will later this week. I think fans on either side of this series appreciate some opinion rather than all the factual information that can be obtained from a score-sheet. But for the moment, here are some of the numbers when evaluating/comparing these two teams. The Hawks had 49 wins this season, 18 more than the Rockets 31 victories. The largest disparity was in goals scored. Portland scored a whopping 328 times, 111 more than the Rockets. Goals allowed were close though. Portland surrendered 229 goals against, only 13 fewer than the Rockets. In the four games in the seasonal series, the Rockets were 0-3-0-1 and were out-scored 15-9. Portland had 104 power play goals this season, 32 more than the Rockets. Both teams were granted over 300 power play chances this season. The Rockets had 328 chances with the extra man while the Hawks had 29 more power play opportunities. The two teams were separated by 30 points in the standings. The Hawks had 102 while the Rockets had 72 points. While the Hawks didn't lose a game in the seasonal series, two of the four games were decided by a single goal. The Rockets out-shot the Hawks in two of the four games but were out-shot 149-123 overall. The Hawks had 14 players with ten or more goals as compared to the nine players on the Rockets that had ten or more goals. The Hawks had six players with 20+ while the Rockets had three. The Hawks were 4 for 16 on the power play (25%) in the four games. The Rockets were 2 for 20 (10%) in the seasonal series. The seasonal series featured two penalty shots. Brad Ross failed to score on Adam Brown and Charles Wells didn't score against Jordon Cooke. * Note - I welcome both comments from Rockets and Hawks fans on this series. Sharing views, opinions is what it is all about. You may not agree with me, nor I with you, but having healthy debate doesn't hurt anyone. Does Bell follow in McMillan's footsteps?